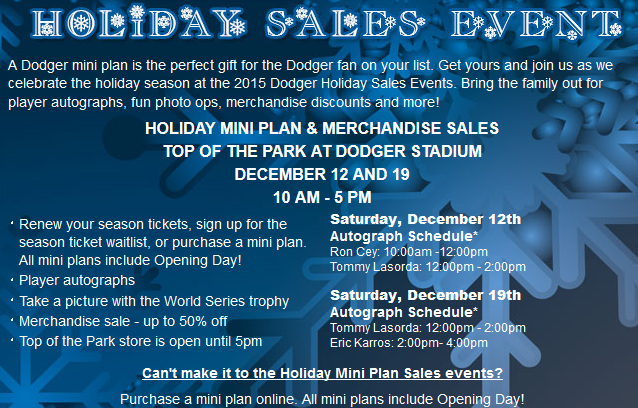 This weekend is the last holiday sale at Dodger Stadium, and Tommy Lasorda and Eric Karros will be on hand at the Top of the Park store to sign free autographs for fans. Go here for information. If you plan on attending be sure to get there early. 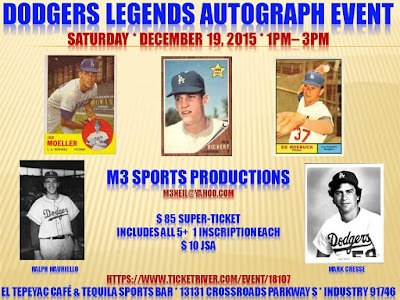 Five more Dodger players will be signing for fans at El Tepeyac Cafe & Tequila Sports Bar in the City of Industry this coming Saturday. Go here or here for information. 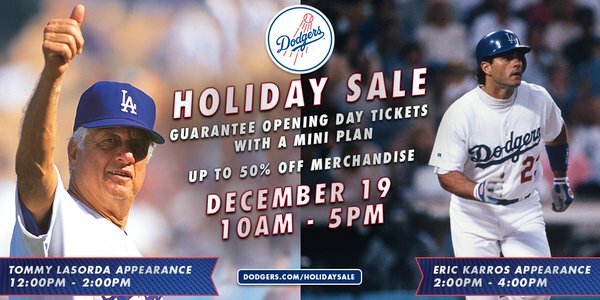 Go here to purchase tickets ahead of time. BTW, all the players coming out are making rare appearances. 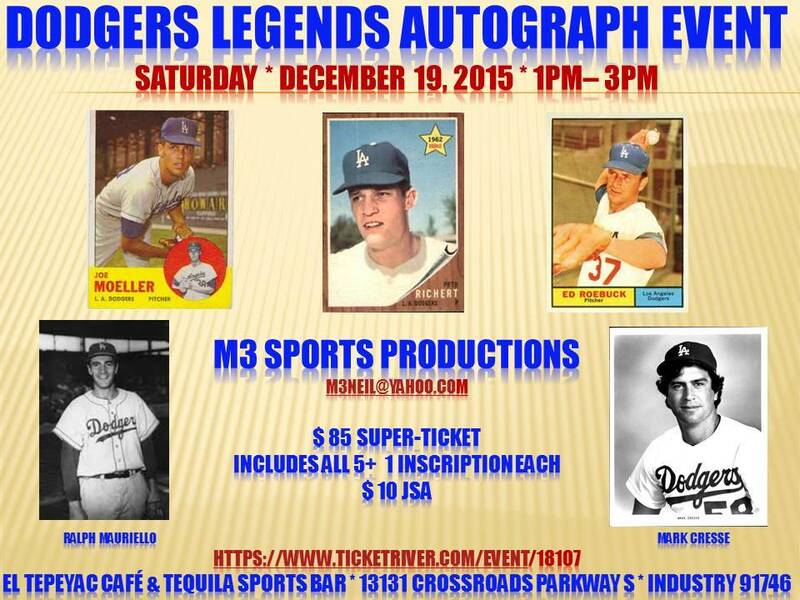 They include Joe Moeller, Pete Richert, Ed Roebuck, Ralph Mauriello and Mark Cresse. As may recall, Cresse was a longtime bullpen coach for the team. Both Don Aase and Al Downing were previously scheduled to attend, but are unable. 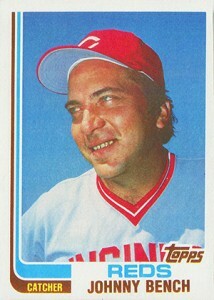 Hall of Famer Johnny Bench will be at the OC Dugout in Anaheim to sign for fans. Go here for information and to purchase tickets. He will be there from 10:00 AM to 12:00 PM. The Dodgers today announced the completion of a three-team trade with the Reds and White Sox, with the Dodgers receiving right-handed pitcher Frankie Montas, outfielder Trayce Thompson and second baseman Micah Johnson; the Reds receiving Jose Peraza, outfielder Scott Schebler and minor league infielder Brandon Dixon; and the White Sox receiving third baseman Todd Frazier. Montas has steadily improved, with his average slider taking a big step forward this year to now flashing plus, his changeup is now enough to give him a starter’s repertoire and he still hits 100 mph at times. The question is whether his delivery and command fit as a starter and most think he ends up as a closer, but there’s still a chance he figures out a way to fit as a mid-rotation starter. Johnson, 24, appeared in 36 big league games with the White Sox last year after making the club’s Opening Day roster and has a .301 career batting average with 153 stolen bases, 24 home runs and 163 RBI in 385 minor league games in four minor league seasons. He entered the 2015 seasons rated as the White Sox’s No. 4 prospect by Baseball America and combined to hit .316 with 28 steals, eight home runs and 36 RBI in 83 minor league games last year with Triple-A Charlotte and the Rookie-level AZL White Sox. During the course of his professional career, Johnson has exclusively appeared at second base following his selection in the ninth round of the 2012 First-Year Player Draft out of the University of Indiana. Montas, 22, appeared in seven games (two starts) with Chicago last year, going 0-2 with a 4.80 ERA, and has posted a 16-25 record with a 3.86 ERA in 92 games (80 starts) in six minor league seasons in the White Sox organization. Montas has limited opponents to a .232 batting average during the course of his minor league career, while averaging more than a strikeout per inning with 390 strikeouts in 382.2 innings. He entered the 2015 season rated as the White Sox’s No. 5 prospect by Baseball America and was honored as a Double-A Southern League All-Star last season, registering a 5-5 record with a 2.97 ERA, a .219 opponents’ batting average and 108 strikeouts in 23 starts with Birmingham. Montas was originally signed by the Red Sox on Dec. 14, 2009 as an amateur free agent out of the Dominican Republic. Thompson, 24, saw his first big league action last season with the White Sox, batting .295 with five home runs and 16 RBI in 44 games. Thompson, who attended Santa Margarita Catholic High School in Rancho Santa Margarita, has been selected as an All-Star at nearly every level during his seven-year minor league career, being honored as a 2011 Single-A South Atlantic League All-Star, a 2013 and 2014 Double-A Southern League All-Star and a 2015 Triple-A International League All-Star, while batting a combined .241 with 94 steals, 101 home runs and 395 RBI in 734 games. The son of former NBA player Mychal Thompson and brother of Golden State Warriors guard Klay Thompson was originally selected by the White Sox in the second round of the 2009 First-Year Player Draft. 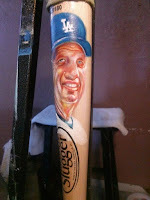 Several weeks back I reached out to a local artist who oftentimes paints the Dodgers for an Blue Heaven Interview. As you may know, from time to time I like to put together these kind of features to highlight artwork, books or anything (really) that I find enjoyable. I've had a lot of fun with these, but never has someone's story been as captivating and inspiring as this one. Gustavo Vasquez story is about dreams... And of chasing those dreams. It's about realizing a talent and letting it take you wherever it may. This is a tale that has gone from sacrifice to poverty to even a taste of success - no matter how fleeting that has been so far. It's a biography that still has many pages left to be written, and I hope that by the time it is all said and done it ends with the kind of success dreams are made of. 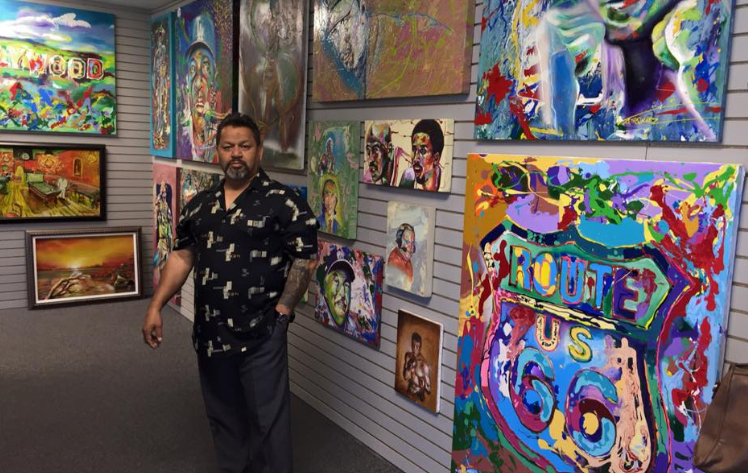 Please meet self taught artist Gustavo Vasquez in the photo above. 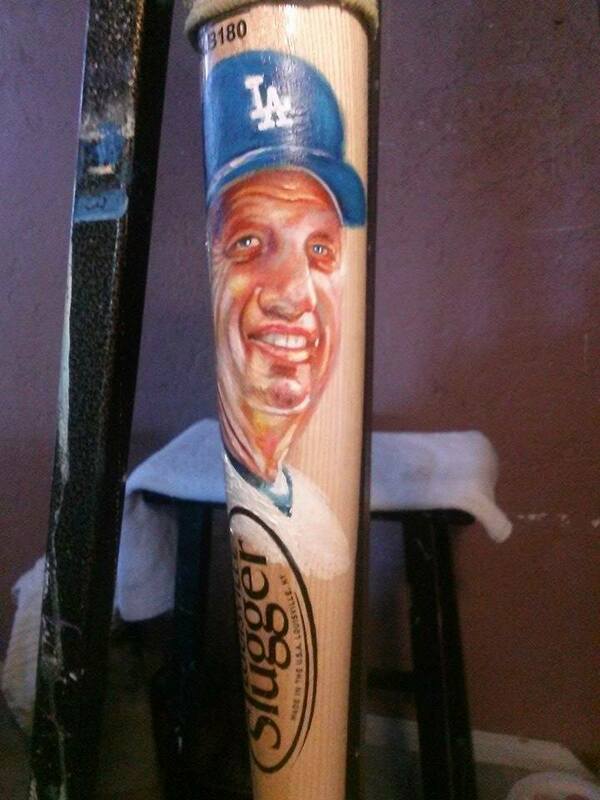 Feel free to check out his Facebook page called "Painter of Champions" here. My interview with him is below. Puig stepped off the plane, and a smile began to form, his eyes began to water. 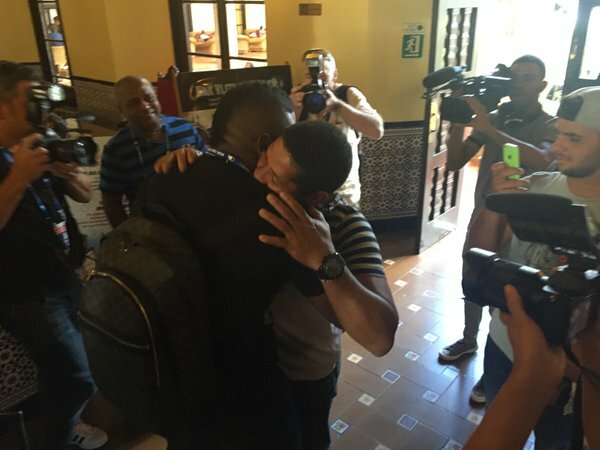 Puig boarded the bus, one headed straight for the heart of Cuba, and finally some words spilled out. "Smell that?" Puig asked, cheerfully. "That's that Cuban aroma!" Puig was accompanied on the trip by his father, Omar, and the Dodgers outfielder embraced an old friend in the hotel lobby, the mentor he affectionately refers to as "Tata," and it looked like he didn't want to let go. I cannot image what this kind of homecoming would be like. We are no doubt in a changed world, and hopefully the folly of politics doesn't get in the way of allowing families to reunite once again. The White Sox have acquired All-Star third baseman Todd Frazier from the Reds as part of a three-team deal that includes the Dodgers, according to sources. None of the three clubs has confirmed the deal. The Reds get prospects Jose Peraza, Brandon Dixon and Scott Schebler from the Dodgers in the deal while prospects Frankie Montas, Trayce Thompson and Micah Johnson go from Chicago to Los Angeles. Via One Nación at ESPN, "Wonder if Clayton Kershaw threw the 12-6 curveball in Cuba?" There's a great interview with Kersahaw worth checking out. Kershaw told ESPN: "I think for me, just understanding the culture a little bit more. It's so important," Kershaw said. "I have, obviously, a lot of teammates who are Cuban, so just for me to understand what they've been through, some of the hardships that they've gone through, understanding how they grew up." 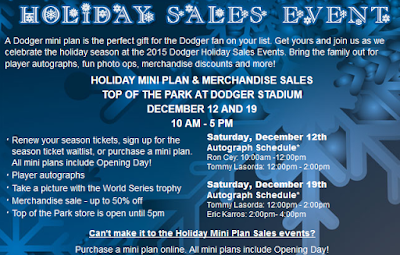 Via Cyd Ziegler at OutSports, "Los Angeles Dodgers executive Erik Braverman comes out as gay to inspire youth." Even with the lingering questions, Braverman is talking about being gay in MLB now so that every LGBT person who might wonder if they can be out and work in professional baseball never again has to ask themselves that question. If you don't know who Maeda is check out this excellent biography by Steven Sypa at Amazin' Avenue. In studying Maeda's PITCHf/x data, one can see that Maeken is a cerebral pitcher. Aware of his lack of overpowering stuff, the right-hander uses what he does excel at–mainly his control and pitch repertoire–to keep batters off balance. Maeda keeps the ball away from hitters' power zones, throws pitches in counts you wouldn't expect them to be thrown in, and relies more heavily on his breaking pitches and off-speed offerings than his fastball. This would seem to be a definite plus for Maeda from a scouting perspective. Rather than succeeding against inferior hitters with below-average stuff, only to struggle against superior hitters, he should be able to adapt and continue using the approach with which he is familiar. Great stuff. Albert Flannery at Agate Type takes a close look at a couple photographs of the 1906 Brooklyn Royal Giants. Check it out here.